My two favourite East Asian cities are obviously Tokyo, since I once called it home, and Hong Kong. I first visited Hong Kong in 1994 in the twilight days of its Crown Colony status. That was when 747s seemed to navigate between buildings landing at the old Kai Tak Airport and trams clattered along the streets. It was a financial hub for sure, but the atmosphere was still one of a British outpost and fading colonialism. Hong Kong nowadays is barely recognisable. It is dynamic and bustling, bursting with energy, the scent of untrammelled Asian entrepreneurism hanging heavy in the air. It also boasts one of the most stunning vistas in the world: 100-storey neon-lit glass skyscrapers amassed at the shoreline to gaze at their reflection, woks sizzling at hawker stands adjacent to Michelin-starred restaurants, luxury brands selling Patek and Prada whilst yonder, an old junk chugs out of Kowloon Bay towards parked supertankers. Over the years, I have got to know Hong Kong well and made many friends within its thriving wine scene. And it’s a wine scene like no other. Weekly mouthwatering dinners, verticals and winemaker-tutored retrospectives create an almost frenzied atmosphere on libation, only possible here where there is such a concentration of collectors within a 15-minute drive of each other. Given such affluent clientele, it is no surprise that many famous chefs have opened branches, so that every time I return, there is a new restaurant to check out. For myself, it is the Oriental–Occidental fusion cuisine that most excites, especially when given a Japanese twist. Since Japan is all about the freshness of seasonal ingredients, Hong Kong has an advantage over Europe or the United States, being just a four-hour flight away. That brings us to Arbor. Arbor is the sister restaurant to Epure and had only recently opened before my last trip in September. I actually dined there twice during my stay, once for lunch with an old friend, then the following night for dinner. I have listed details of the lunch menu, but this Vinous Table focuses on the extraordinary dinner. There were three goals for the evening soirée. Firstly, to check out Arbor’s food, since this was the first time many attendees had visited. Secondly, to enjoy some very serious old Claret. Thirdly, as is customary in “Honkers,” to have fun. I will begin with the food. 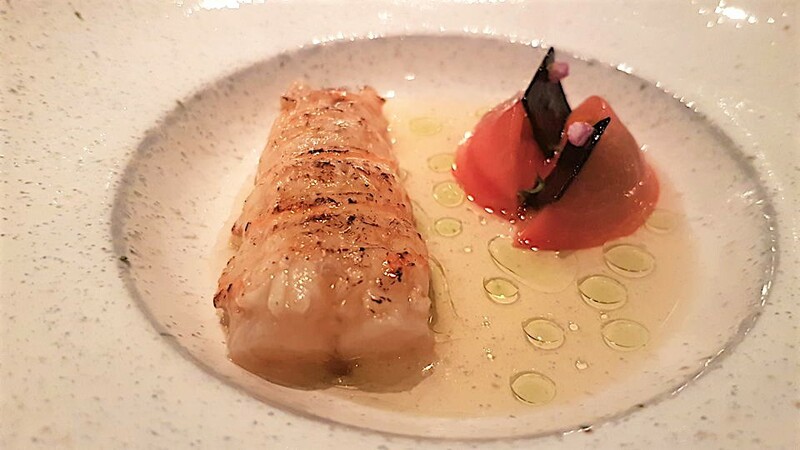 The head chef is Eric Räty, originally from Finland, whose CV includes the three-Michelin-starred Restaurant Aqua in the Ritz Carlton Wolfsburg and Café Grey Deluxe as understudy to chef Grey Kunz. Since the owner has a strong passion for Japan, there is a constant Japanese influence on dishes inspired by nature and the changing seasons, ostensibly kaiseki cuisine. The focus is on sourcing the finest ingredients, and naturally, many are imported directly from Japan: garlic flower from Fukuoka or Wagyu beef from Kumamoto, for example. Plus there is a very Japanese aesthetic; every dish is a work of art, provoking pangs of guilt as you destroy with your spoon or fork what must have taken hours to prepare. 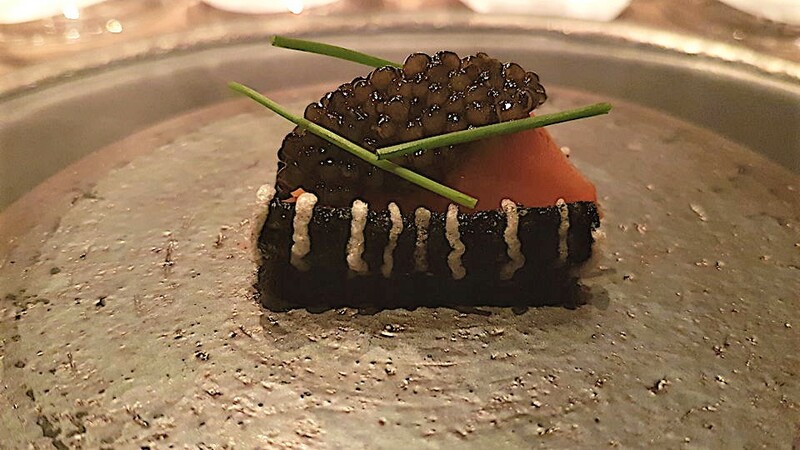 The first course was kaluga caviar (from an Amur River basin sturgeon that is apparently the world’s largest freshwater fish) delicately placed upon a smoked Japanese trout, wasabi and a Japanese nori cracker. Two words: utterly divine. And then to partner that with 1971 Krug Collection? I will add another word: heavenly. Next came the langoustine, charcoal-grilled to retain succulence and accompanied by Japanese tomato and kombu kelp candied with black sugar from Okinawa and liquorice root, along with cassis berries and shiitake mushrooms in Guinness beer served with a dressing of tomato juice and bonito vinegar. It is the best langoustine I have eaten this year. The combination of ingredients was nigh perfect. This was swiftly followed by the foie gras. It probably represents a lifetime’s worth of calories on a single plate, but its melt-in-your-mouth texture makes you soon forget that. The turbot swam in from Brittany and came in a slow-simmered broth made from fish bones and fish heads, seasoned with green chilies and pickled mustard leaves (takana). Beetroot and cassis offered sweetness that offset the spiciness and the acidity deriving from finger limes. It would be my “Turbot of the Year” were it not for Brat. (LINK) The pigeon flew in from Racan in the Pays-de-la Loire, France, and was cooked perfectly pink and tender and served with figs, mashed potatoes and hazelnuts. The following course, the Wagyu beef, came from Kumamoto on the southern island of Kyushu in Japan. This Wagyu was classed A4 (incidentally, readers should note that I will delve deeper into Wagyu in an upcoming Vinous Table from Tokyo). 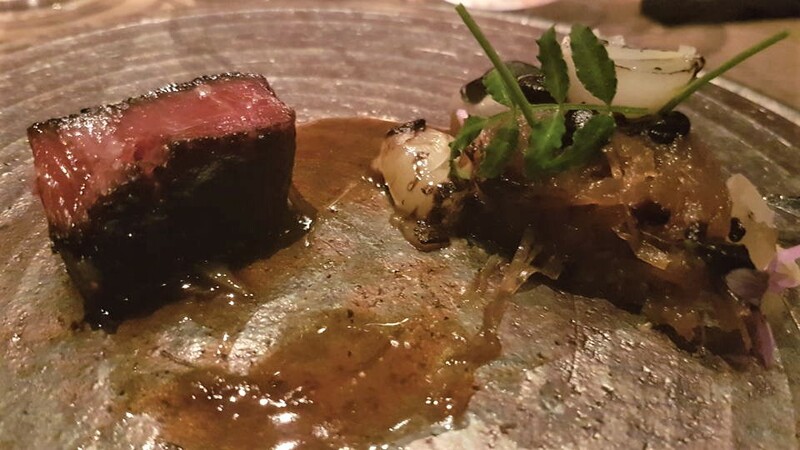 The meat was charcoal-grilled with a white miso glaze and served with beef jus seasoned with Japanese yuzu, bone marrow and Hitachino Nest dark beer that imparted just the right bitter edge. This was accompanied by caramelised onion, again cooked with yuzu and dark beer, and a side of pan-roasted black garlic and garlic flower from Fukuoka. The cheese course was 24-month-old Comté from the Xavier fromagerie in Toulouse, and then, to finish off, lemon- and lime-zest-infused madeleines whisked straight out of the oven. It was all as delicious as it reads. The trick is to deliver intensity of flavour with subtlety, a culinary art form that reaches its height in Japan. 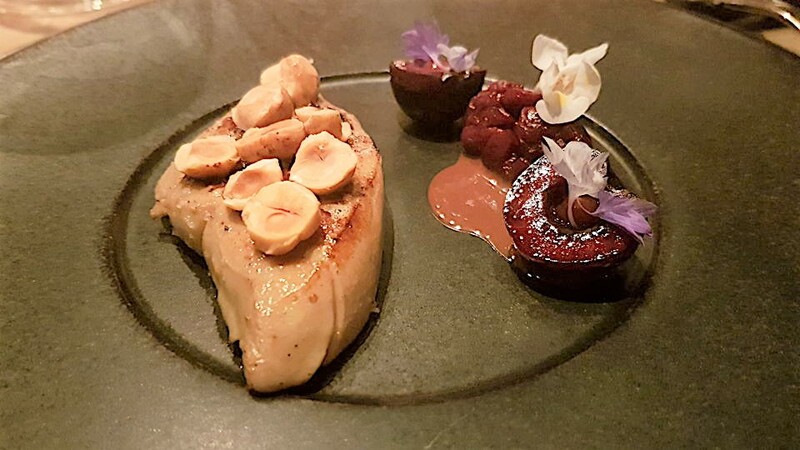 Eric Räty seems to pull it off effortlessly at Arbor, perhaps because of the synergy between Scandinavian and Japanese cuisine and ingredients as much as his obvious talent. Like many Japanese restaurants, you eat well and yet depart without feeling stuffed. I cannot wait to return. Now we must broach the wines. Where do I begin? The theme this evening was old Bordeaux, and the youngest vintage served was almost 60 years old. That makes the vinous fare already special. However, every bottle came from ex-château auction, so provenance was not an issue (or at least, so we thought). 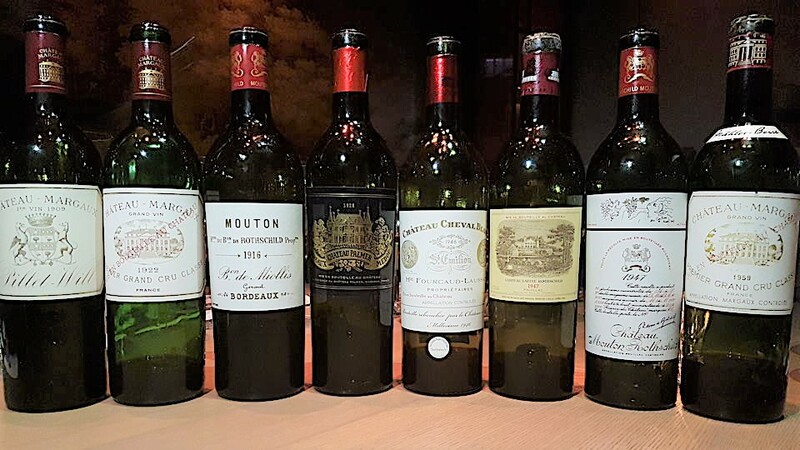 Every wine here had resided in the château cellars before a single journey to Hong Kong, where it had been stored in a perfect humidity-controlled cellar, which explains why the labels were in mint condition. A month earlier, I had been presented a list of possible wines. It was difficult to choose one, but in the end, I suggested that given provenance, why not venture towards more esoteric vintages and take a chance? They might not rank amongst the greatest we would ever taste and yet they might very well constitute the only time any of us taste them. We commenced with a glorious magnum of Krug. I must confess that I am occasionally disparaging about vintage champagne - my counter-reaction to all the hype that seems to surround luxury grandes marques. Yet 1971 was a stupendous year for vintage champagne, and this ranks among the best. The 1971 Krug Collection has a deep salmon, almost onion-skin colour, to the extent that it seems like a rosé! The nose is quite ethereal, offering scents of pressed rose petals, bergamot tea and hints of dried apricot, and later manifesting a discreet potpourri aroma. The refined, poised palate is beautifully balanced - nothing powerful or ostentatious – and presents subtle citrus peel, lime and morello cherry notes. There is pitch-perfect salinity on the finish that begs you back for another sip. This is everything you really want from mature champagne: Krug firing on all cylinders. The Bordeaux wines were all served in pairs. First we travelled back over a century to 1909. I have an ambition to taste every vintage of Bordeaux from 1900 to the present, and this ticked off one of my missing eleven vintages. The 1909 Château Margaux comes from a long-forgotten vintage that was ruined by August storms. It predates the Ginestet family’s proprietorship and sports an old Pillet-Will label. Initially it could not disguise the fact that it comes from a difficult growing season. The nose is rather flat, slightly metallic and herbal, whilst the palate feels a little rigid and clearly lacks vigour. Over the course of three hours, it never blossoms into something magical, but it does manifest more red fruit and slightly more delineation. It cannot quite shake off its dourness despite impeccable provenance. The 1909 is a curiosity, but an interesting curiosity and perfectly drinkable. The 1922 Château Margaux, which is born from a potential good vintage spoiled by September rain, is paler in colour than the 1909 tasted alongside. Likewise, there is a greater sense of airiness, more light than shade compared to the 1909: redcurrant and crushed strawberry fruit, subtle scents of pressed roses, stewed tea, and loam-like scents emerging with aeration. The palate is medium-bodied with fine tannins. It is not the greatest ancient Château Margaux that I have encountered, but it is balanced and refined with just a modicum of grip. It gains a soupçon of weight and girth towards a leafy finish that is commendably defined after almost a century. It never delivers a commanding performance, though undeniably, it has held up well. We remain in Margaux for the next bottle, the most controversial of the evening. The 1928 Palmer is legendary and I can vouch for that first-hand. This bottle had been reconditioned at the château and then sold at auction, our host the lucky bidder. However, we immediately detected something was awry. It was not corked. Yet the aromatics were muddled and lifeless, the palate laboured and missing Palmer’s elegance and finesse. I commented that it was if the wine had been lobotomized. The lights are on, but nobody is home. Upon further investigation, some other attendees reported similar disappointments with reconditioned bottles. Could it be that their reconditioning procedure at that time had been mishandled to the detriment of the bottle? Personally, I have far better experiences courtesy of bottles with low ullage but without any reconditioning because often, the wines are simply too delicate and sensitive to be exposed to oxygen, even for a brief period, before topping up and re-corking. The 1928 was a big disappointment and I noticed everyone’s glass remained untouched. I have added a tasting note for an uncompromised bottle of 1928 Palmer on the Vinous database, just in case you want to know what it should really taste like! The misfiring Palmer was paired with a bottle that could be completely excused if it had not come up to scratch, since it was born in the middle of the First World War. I have encountered a couple of bottles from this vintage, not least a sublime 1916 Malartic-Lagravière a couple of years ago. So perhaps that raised my expectations to an unrealistic level. The 1916 Mouton-Rothschild predates the arrival of Baron Philippe de Rothschild by six years. He had been evacuated during the war, and Laura Thérèse, the widow of Baron James de Rothschild, who had passed away in 1881, ran the then Second Growth until 1920. It has a pungent nose of bell pepper, root vegetables (celery?) and beetroot, evidence that the Cabernet Sauvignon was picked before full ripeness had been reached. Pinch your nose and you can tell that the palate is decent enough, quite Loire-like in style with bell-pepper-infused black fruit and a conservative, rather ossified tobacco finish. It is immoral to criticize this wine given both its historical context and its age, but you have to tell it like it is. For the next pair, we skipped over to the Right Bank. The 1946 vintage is, or rather was, the only postwar Bordeaux vintage that I had not tasted. It is actually my father’s year of birth, so I have always been intrigued by it. Falling amongst a succession of heralded vintages, sandwiched between the lionized 1945 and the feted 1947, the 1946 vintage fell between the cracks, a potentially good vintage spoiled by early September showers and a resulting uneven harvest. It is almost completely forgotten nowadays, although the handful of people who have experienced now rarely seen bottles always reported back positively - and now I can see why. The 1946 Cheval-Blanc was then owned by a société civile formed by Albert Laussac Fourcaud before he passed away in 1927. It is youthful in colour, with thin bricking on the rim. The bouquet is quintessential Cheval Blanc, perhaps more Merlot-driven than Cabernet Franc, offering vivid red cherry, strawberry and light cranberry fruit and touches of cedar and crushed stone developing with aeration. While no match for the finest vintages of this Saint-Émilion, it is certainly well balanced, displaying fine tannin, superb acidity and respectable energy given its age. Maybe it tapers in a little towards the chlorophyll-tinged finish, but otherwise this is a thoroughly enjoyable wine that might give the under-performing 1945 Cheval-Blanc a run for its money. The 1946 Cheval-Blanc was paired with the 1959 Château Margaux. This bottle was not quite up to the stellar example poured in November 2017, although it is still magnificent. The 1959 Château Margaux could probably have benefitted from decanting three or four hours before serving. But it has wonderful definition and tension on the nose, with those telltale sea cave and marine traits, though it constitutes the most backward example I have encountered. The palate is, again, a little more tannic than the previous bottles, but it is extremely well poised and pure, still replete with that finely chiseled finish. Maybe the previous bottle demonstrated a touch more joie-de-vivre than this one, whose provenance likely played its part in its initial rigidity. Fortunately, after an hour in the glass, it begins to blossom and reveal floral elements on the nose and finesse on the palate. The final pairing saw a return to Pauillac. For some reason, I was convinced that I had tasted the first wine before, but searching through my records, it would seem not. The 1947 Lafite-Rothschild had been re-corked at the property in 2008. It has a wide tawny rim, indicative of its age. The bouquet is divine: blackberry and raspberry, wild hedgerow, hawthorn, hints of meat jus and a subtle, almost marsh-like element. The palate is not as complex or as opulent as the ethereal 1947 Mouton-Rothschild tasted alongside, yet I am impressed by the weight and vigour, which deftly disguise the late-summer heat that afflicted many 1947s with volatile acidity. This is a quintessential Lafite-Rothschild, though if I have one quibble, I could have done without the caramel, toffee-like note towards the finish. As good as the Lafite-Rothschild was, it could not compete with the brilliant “other” Rothschild. The 1947 Mouton-Rothschild flirted with perfection when encountered a year earlier. Maybe this bottle is more backward on the nose due to provenance, since it is not quite as ethereal, yet it attests to what must be the best Left Bank of the vintage. It comes replete with exquisite black fruit and razor-sharp delineation, the graphite element heightened with aeration. The palate is medium-bodied with grippy tannin, ample freshness and amazing weight. Again, it is the pitch-perfect acidity that defines this formidable Pauillac, which continues to amaze. The 1928 Palmer has an ethereal bouquet that is neither intense nor powerful, yet is elegant and poised, offering red plums and mulberry infused with juniper berries and rusty iron piping. The palate is medium-bodied and indicates a once formidable, doubtless tannic Margaux that has since mellowed and evolved a texture that has more in common with the Côte de Nuit. It is extraordinarily harmonious and beautifully delineated, extremely long and, while undeniably a wine that is probably in gentle, graceful decline, still exquisite.